This FlexEx Original package contains 1 blue (hard), 1 red (medium) and 1 yellow (soft) part (3 parts total). 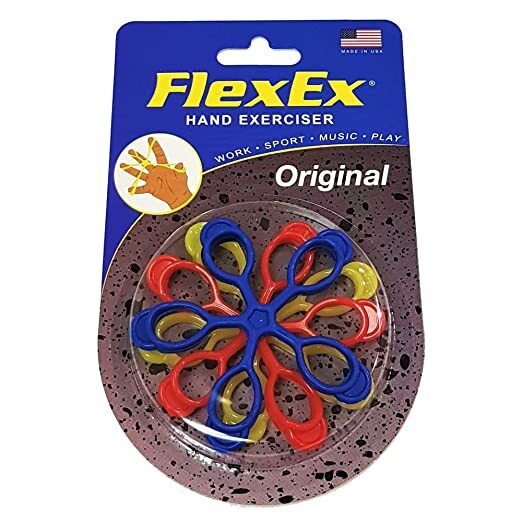 FlexEx is a simple, easy to use finger, hand and forearm exerciser for Computer Users, Sportsmen, Musicians, Tennis/Golfers, Climbers, Exercise Enthusiasts and any one who wishes to strengthen their hands, wrists, forearms and fingers, improve your sport or rehabilitate weakened hands and fingers. Use FlexEx to achieve increased hand, forearm and finger strength in an easy, simple, non-cumbersome way. FlexEx is the most lightweight hand, forearm and finger exerciser on the market today. So simple and non-cumbersome, the FlexEx can be used any place and any time. Just throw it in your pocket or purse and use at your convenience. This FlexEx package contains 3 different resistances, all provided to you at the time of purchase. The Red FlexEx offers medium resistance and is suited for most individuals wishing to strengthen their hands, forearms and fingers e.g. computer users, and those who play a musical instrument. The Yellow FlexEx offers light resistance and is used for physical therapy, rehabilitation, and by those with weakened hands possibly due to carpal tunnel syndrome or post surgery, etc. Strengthen your hands and improve your sport the simple, easy way with FlexEx, for Strong, Healthy, Pain-Free Living! Proudly Made and Packaged in the USA!